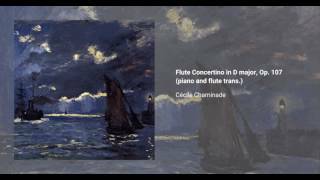 Cécile Chaminade wrote her Flute Concertino in D major, Op. 107, in 1902. Originally conceived as a piece for orchestra and flute and dedicated to flautist and teacher Paul Taffanel., it was later transcribed for piano and flute. The work was comissioned by the Paris Conservatoire, possibly as an examination piece for students. It remains a standard piece in the flute repertoire, considered technically challenging for most players.